Red vinyl with three extra tracks. Follow-up to 2016’s By Default, the new album was produced by Richard X. 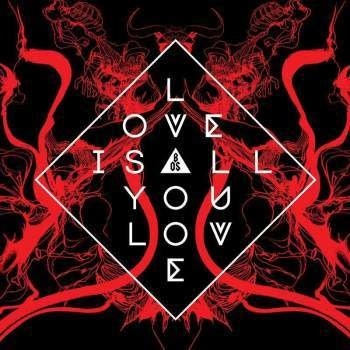 Love Is All You Love was recorded in London’s Miloco Studios, The Smoakstack studio in Nashville, and in the Southampton studio of Band Of Skulls founder members’ Russell Marsden (guitar, vocals) and Emma Richardson (bass, vocals). Following the amicable departure of drummer Matt Hayward, Russell and Emma started the writing process for the record in 2017 and quickly accumulated a host of new songs. It was a free and experimental process mixing electronic and live instruments, working quickly, getting ideas down, then moving on. Work then switched to The Toyshop studio at Miloco to collaborate with Richard X, known for his innovative production with artists from Pet Shop Boys to Goldfrapp to Sugababes, whose Freak Like Me was one of the standout singles of the 2000s. Richard X encouraged Band Of Skulls new spirit of experimentation, pushing the combination of live and electronic as mixing the two was creating interesting dynamics. Once the writing was complete the band decamped to Nashville to record the live element of the record with Eagles Of Death Metal’s Julian Dorio on drums. All these elements added a heavy punch and power to Love Is All You Love, especially on the unrelenting Carnivorous and short sharp shock of That’s My Trouble. Cool Your Battles is more widescreen, while We’re Alive has a heavy dance pulse with a touch of melancholy. The song Love Is All You Love focuses on the groove and keeps the feel of when they tracked it live in Nashville. This song in particular seems to encapsulate the sentiment of the whole record.